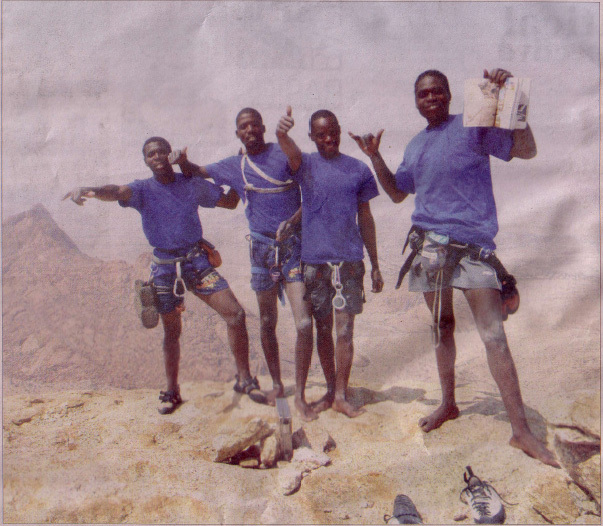 FRIDAY, August 27 2010, was a historical day for Namibia and four Kavango rock climbers, after they reached the top of the formidable Greater Spitzkoppe near Usakos. The Greater Spitzkoppe are apparently the second highest mountains in Namibia (after the Brandberg) peaking at 1 725m. 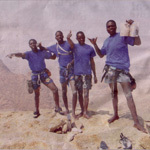 Aron Muhoko, Muhuli Mbanje, Nyanda Kampasi and Bethold Muronga (in the photo), were part of a group of eight climbers. The leaders of the group were top rock climbers from South Africa, Steven Bradshaw and David Glass. They were joined by Angie Bradshaw and Antonie van Heerden. As experienced as some of the climbers were, this was the first time any of them climbed this specific mountain, according to Van Heerden, who is also General Manager of Cape Orchard Company in the south of the country. He said the group started their ascent when it was still dark at five o�clock in the morning and had to use head-torches to negotiate the approach-route over boulders, through narrow chimneys, and steep terrain. High up on the mountain, after about three hours of scrambling, the group roped up for the five climbing pitches, reaching the peak at noon. �Everybody was overwhelmed by the tremendous views from the peak and accomplishing their dreams to stand on top of this magnificent world famous mountain. The look on their faces were as if they had been �born again�. I don�t think they had a clue what to expect. After some photographs, lots of smiles, long exposed abseils and the final decent, the group was back at the vehicle after an 11 hour day of mountaineering,� Van Heerden told The Namibian. He said a small container, with a little book inside, has been placed on the peak for mountaineers and rock-climbers to enter their names, for future climbers to see. According to him, the 600th climber reached the peak last year. The first time the peak was officially reached by the �standard route� was in 1946 by a company of three: J. De van Graaf and H. and E. Wongteschowski. Van Heerden said his company ascended by the same route and that the first ascent before by black Namibians were two members of the local Damara community, making the �Kavango ascent� history. He said that there are currently hundreds of mountain routes but only a few sport routes (for the more adventurous climber) to the top. The four Kavango rock climbers all work for Export Table Grape farm at Aussenkehr and have been training since April last year. Their training was done on an indoor climbing wall in the pack shed of the company as well as the climbing routes in Kings Throne Canyon in Aussenkehr – which is much lower than the Greater Spitzkoppe. Asked if anyone has ever died trying to reach the top, Van Heerden said that there was a legend of a Schutstruppe soldier in 1904, that did apparently climb to the top and made smoke signals, but he apparently never came down again – nor are there any signs of a grave or any other details of the man.